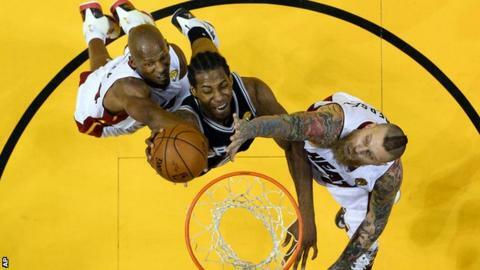 San Antonio Spurs took a 2-1 lead in the best-of-seven NBA Finals with a 111-92 victory over Miami Heat. It was a first home loss of the playoffs for Heat, for whom LeBron James and Dwyane Wade both scored 22 points. Kawhi Leonard scored a career-high 29 points for Spurs in a game they dominated from the start, hitting 19 of their first 21 shots - an NBA finals record. Game four is in Miami on Thursday.